Takashi Murakami (American/Japanese, b.1962) is a painter and sculptor famous for his integration of Fine Art, commercialism, Japanese aesthetics, and cultural criticism into his work. Murakami received his BFA, MFA, and PhD from the Tokyo National University of Fine Arts and Music, where he studied Nihonga (traditional Japanese painting). He first gained recognition as a sculptor during the early 1990s, exploring otaku (the Japanese term for an obsession with anime and cartoons) and the contradictions between contemporary Japanese society and American culture in his work. In 1996, he created the Hiropon Factory in Japan, which later developed into Kaikai Kiki Co., Ltd., a large art-making and artist management corporation. Murakami is also a curator and a critical observer of Japanese art. In 2000, he founded the “superflat” movement, a post-modern style drawing inspiration from Japanese manga (comics created in Japan), graphic design, and traditional Japanese prints and screen paintings. 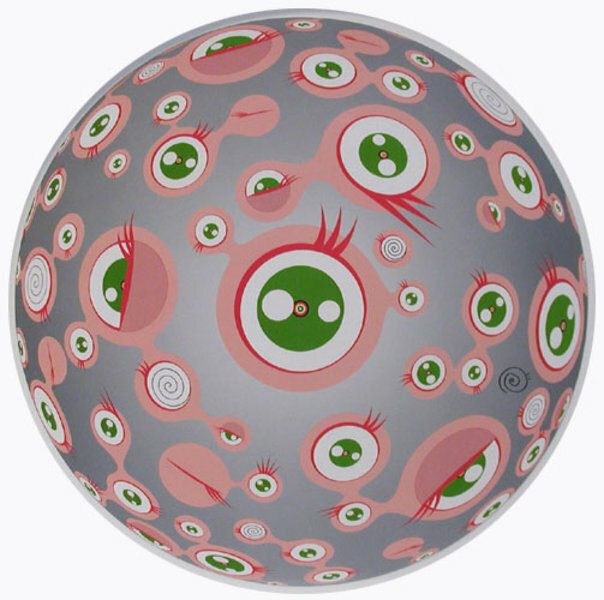 Throughout his career, Murakami has increasingly blurred the boundaries between fine art and popular culture by branding his artwork and turning it into merchandise, particularly with the celebrated character Mr. Dob. His embrace of the commercial side of art reached a high point in 2003, when the artist began collaborating with Marc Jacobs in the redesign of the Louis Vuitton logo and handbags. Murakami currently lives and works in Tokyo and New York.